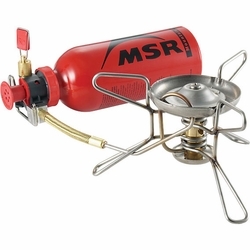 MSR Whisperlite Stove. The WhisperLite camp stove has been the one to choose on outdoor adventurers for more than 20 years. Backpackers, climbers, hikers and adventure travelers alike have come to rely on its easy-to-use design and durable, stainless steel and brass construction to deliver dependable performance in most any situation. Compact: Flexible fuel line folds small and fits in most MSR� pots. Field Maintainable: Shaker Jet� technology and smart engineering allows complete cleaning and maintenance in the field.